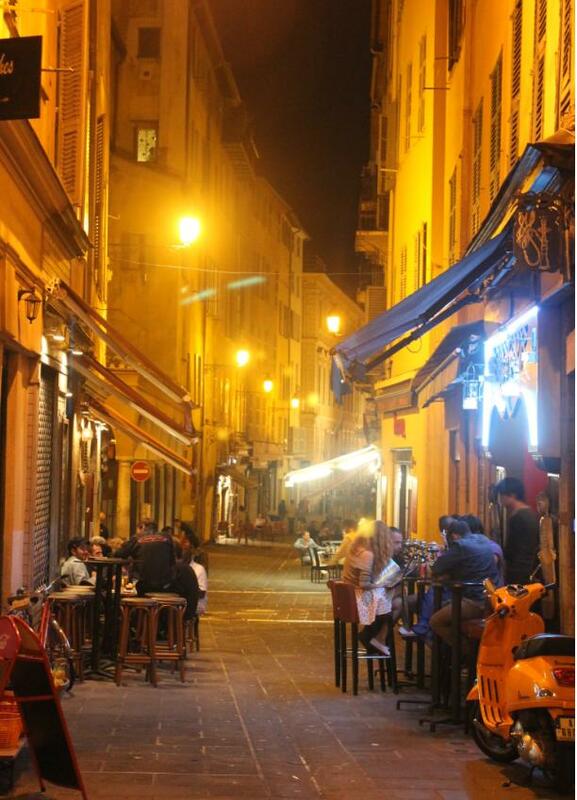 Some few bistrots that both my wife and I had recently tried in Nice. Sorry for the lack of photos. I took no picture of the meals at each of those places for the simple reason that I find it more important for a couple to share the moment of being together rather than being constantly distracted by such subjects as food photography or food discussion in general. It is one thing to know your food and appreciate it, it is another thing to have it invading even the private moments you need to enjoy. Though we happened to cool down with this photo restriction as we, during this strip, took pics of our meals at 3 star Michelin L’Arpège and Le Louis XV (see other reviews on this blog). CA is an institution of Nice, its cooking of typical provencale traditional bistrot style, its setting representative of that cooking style, though somehow packed with enough warmth, both in the décor and ambience, to keep this place inviting, many institutions having lost that feature. Personal verdict: 6.5/10 – I am always nervous when I visit an institution, having high respect for the weight of their history, for sure, but that should never be an excuse for the food performance to step back (the faith of so many institutions), and my visit here did not suffer from that aversion: the food, in the traditional spirit of Nicois cuisine, was executed properly. Keep in mind that it is not meant to wow, and I do not see why that should be expected from it neither (unless, of course, traditional Nicois cooking is the ultimate thing to you), but things here are done as it should (which means, as it has always been). The highlight: they bake an excellent pissaladière ! The weak spot of that meal: the chocolate mousse of my wife was average. PS: My wife was not blown away, but as I told her, in this particular case it is surely because she is not into that kind of food. It’s like in Montreal, where we live, we know what’s a great poutine and great traditional Quebecoise cooking is delicious to us, but for someone who knows nothing about those….it means nothing. I was exposed to traditional Nicoise cooking in my tender teenage years in Southern France, so I know what is bad or good Nicoise cuisine, but I do understand that for someone who has no clue of what it should be (not to be taken the bad way, just trying to be pragmatic here) , it remains just food that they judge based on their own point of references. I also understand that it is hard to get excited over a classic salade Nicoise, some farcis, but they are doing things the way it should here at Chez Acchiardo, they are doing it well and the two brothers (Dad and Mum are still around) are amazing hosts. What they did and that younger generations will perhaps like is that they have imparted a bit of modernity to the house (for eg, the toilets, downstairs, are very very contemporary especially when I dig into the souvenirs I have of Chez Acchiardo, last time I was there over a decade ago). Remains one of my favourite provencale / Nicois bistrots in France. This is one popular provencale/nicois bistrot, the revered cookware being the cook pot, the cooking traditional but without the heavy old fashion feel that traditional cooking can sometimes suffer from. Personal verdict: 5.5/10 in the classic ‘ provencale/Med/Nicois bistrot’ category. Again a score to be taken in relation to my assessment of my food here on this dinner rather than comparing to scores of other meals. In view of the fair prices, La P’tite Cocotte is definitely a good value restaurant. Though I did not find the flavor combinations to rise beyond the ordinary of this type of bistrot food (for eg, my terrine of foie gras was good, but not particularly memorable as I have enjoyed at many bistrots, my filet mignon of beef was cooked well and had good taste but nowhere close to the most exciting filet mignons I had at numerous bistrots). The highlight: the original idea of using the cook pot as their trademark tool. Even the bill is found in a tiny cook pot. The weak spot: no particular weak spot, just not great emotion like the pissalardière I had at Chez Acchiardo or the food I had at Bistrot D’Antoine. Still, go find for yourself: it’s a cool place, the staff is nice, the Chef was there working hard in his kitchen (you should always encourage that, it’s called ‘respect’ for the customer), the food had no technical problem (all cooked well) and as always, it’s a matter of preference / style/ taste (nothing was wrong with our meal here, but both my wife and I prefer flavors that are bolder / more eventful). This is one of the most popular bistrots of Nice, and it was not hard to face that reality: almost fully booked at 7:15 pm when we arrived, 7:15 pm being their opening hour for dinner. Then it simply never stopped: hordes and hordes of diners kept getting in and out. There are two servings here, but we did not felt rushed at all. Personal Verdict: 9/10 in the Nicois/Provencale/French category. A sign that your meal is memorable is when, days later, you remember each item you had and its exact price. When we were there, they had (among several of their very appealing menu combos) a 33 euros 3 course seafood tasting of lobster. The first course was a lobster bisque with texture coming straight from a photoshoot, that glamourous, and then there was such character in the flavor of that bisque that I thought a top 3 star Michelin Chef like Joel Robuchon or Frédy Girardet came out of retirement and decided to please some diners momentarily and discretely in this kitchen, Lol. The rest was stunning after stunning bistrot food: a risotto of lobster like few kitchen brigades can deliver. Even a simple Panna cotta, looking not that refined at all ( rustic, traditional looking, which I think is not a bad thing after all), avenged my hasty judgements on its looks by storming my palate with divine taste. I was a bit afraid that its online popularity would have more to do with tourists simply finding this place to fit with the usual clichés that they are looking for, but I was wrong: that meal was food that I now rank in my top 10 French bistrot meals ever. I do not know if BA performs like that every night, I just know that for its outstanding work of profound delicious flavors, great texture of the food, overall enjoyment of it all…that meal…that one we were having…was one of those rare bistrot meals that I had no other choice but to use as a point of reference. I am almost afraid to go back, lol. In facts, when I asked my wife if we could try booking it a second time during our stay on the French Riviera, she replied ‘you do not want such souvenir to be wiped away…,lest it rest intact on our minds‘ ..Rfaol!!l! This is was a reminder that France remains one of the few greatest destinations for oysters. I am a long time huge fan of oysters and their big plump, creamy and juicy oyster had myself going back there day after day all along our 4 days stay on the Cote D’azur, oftently 2 times per day in between 2 other restaurant meals. Crazy, I know…but their oysters commended loyal follow up, Lol. Imagine…in France, there are many other great and even better oysters than those,,, That said, I did not find CTD’s eur 42 seafood platter to be that stunning, though largely a winner when compared to any seafood platter in Montreal … just keep this in mind: no oyster in Canada or in the US, as great as some might be, do get close to the Roumégous oysters offered at Café Turin). It’s the oysters that really kept me going back. The rest was so so (my wife picked a pasta/seafood dish 4/10 and an Ile Flottante 3/10 that were average at best). So, CDT, for the seafood platter 7/10 *** (yeah, perhaps ..well at least, far better than anything found in Montreal, of course) and the Oysters 10/10 (YEAH..YEAH..THE BIG JUICY/PLUMP ones with fabulous taste of the sea!!!). The Roumégous oysters are indeed among world’s finest. Oh la la! ***my seafood platter had tiny pink prawns of not much interest ( I had far more memorable ones elsewhere ), whelk that was excellent, winkles I did not care for and the star oysters. 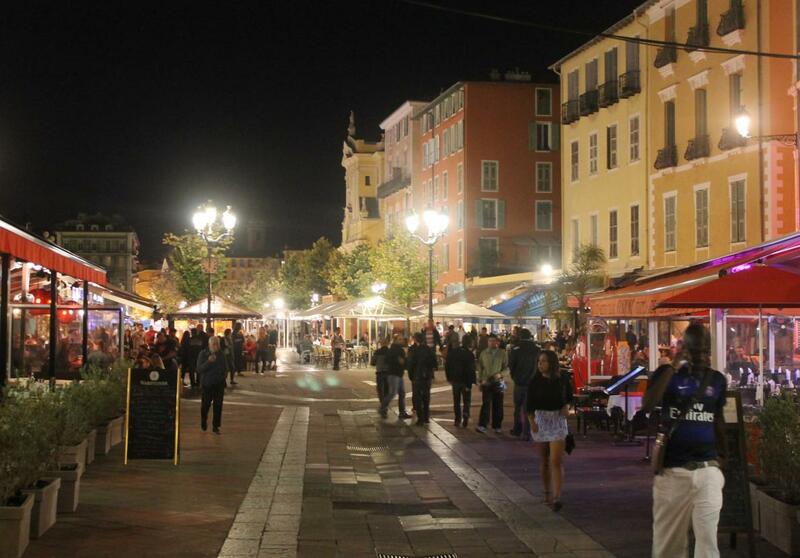 Nice was really great as I remember it from almost two decades ago. They really have the sun shining for them, and it continues to be one of the GREAT FUN GORGEOUS CITIES OF THIS GLOBE. Some few places that I regret of not having visited on this trip: Carré Llorca (http://www.carrellorca.com) of Michelin star Chef Alain Llorca and Chez Palmyre (5 rue Droite, 04 93 85 7 Nice, France (Old Town / Vieux Nice) of an amazing Chef who trained under 3 star Michelin star Chef Guy Savoy and is now offering his food at very low cost (for eg, less than eur 20 on lunch. And he is there, in his kitchen…no wonder why France remains one of the REAL world’s greatest food destinations….